One of my favorite little places in our apartment has to be our entryway nook. I already showed you how I went about finding some reasonably priced furniture to hold all of our stuff for the winter months. Inspired by the tons of beautiful mantle arrangements I’ve been seeing online lately, and because I don’t have a mantle to decorate, I decided to decorate my entryway for the first time. Here’s how it turned out. Pretty festive, in my opinion. Not really sure why I never thought of decorating it before. I love that it’s one of the first things guests see as they walk into the apartment, and it’s one of the last things you see before you leave. The frame was on sale for $5 at Michael’s. 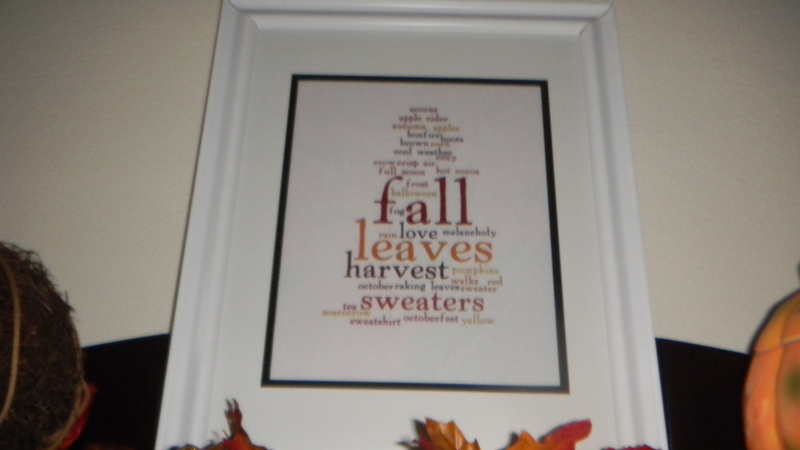 The print is a free printable I found here. 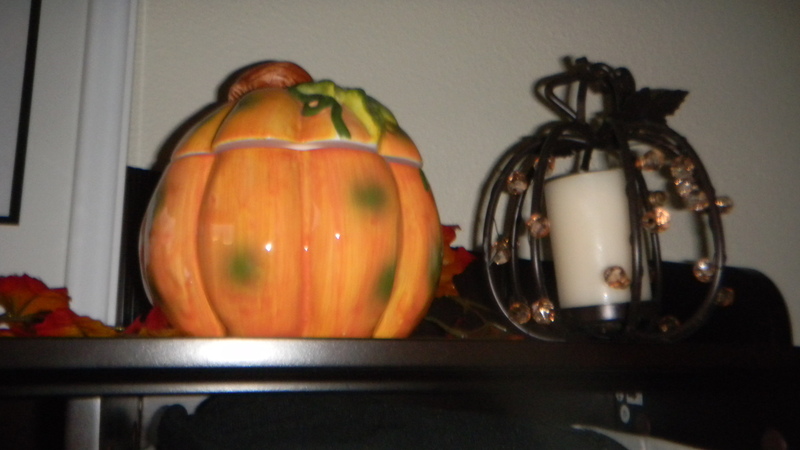 The ceramic pumpkin on the right is a candle I’ve had for ages, so we’ll say that one’s a zero cost item. The iron wrought and beaded pumpkin further to the right was a Michael’s purchase. 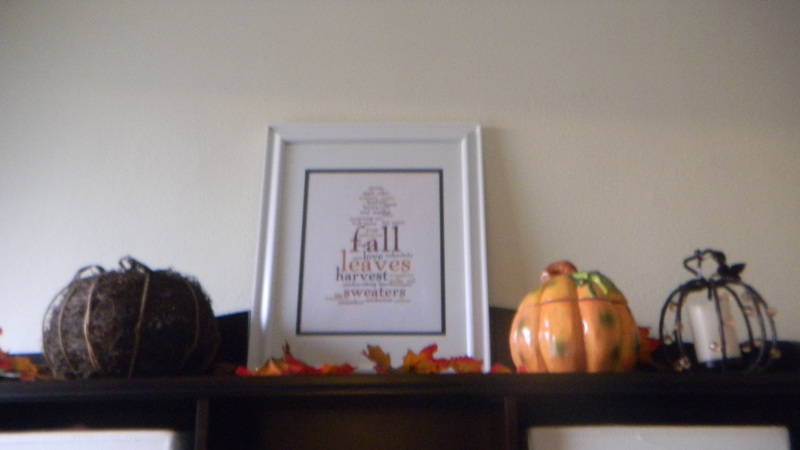 Their fall decor was 50% off, so this little guy rang up for $2.50. The candle was free from Pier 1. 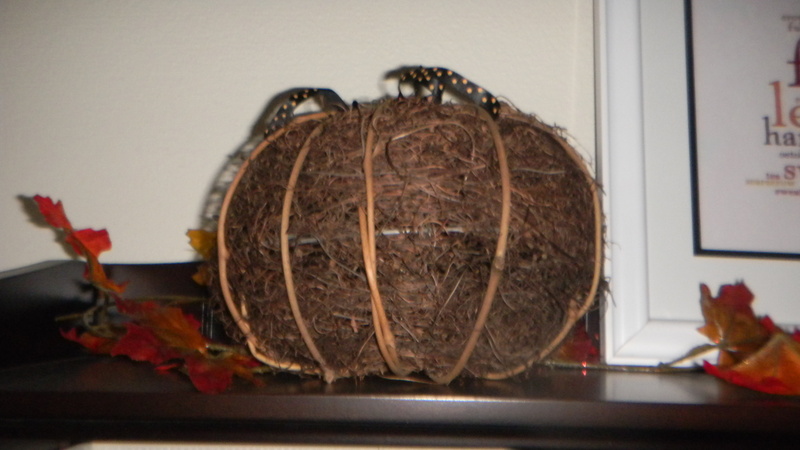 The grapevine pumpkin on the left was purchased at Target’s Dollar Spot, though it did cost $2.50. I had the black and orange polka dot ribbon already. Finally, the leaf garland is the same kind I purchased for the hurricane candle holder from my other fall decorations post. It was purchased for $1 from the Dollar Store. I’m really happy that most of these items will stay on that ledge for Halloween and Thanksgiving. I won’t have to change out the entryway decor until Christmas! Who knows, maybe new decorations will even be added. I’m sure I’ll tell you if they are.